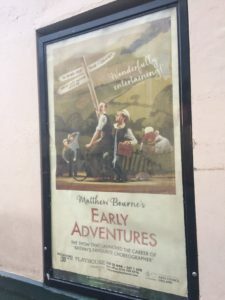 A rewarding experience for newcomers and long-time fans alike, Matthew Bourne’s Early Adventures is exactly that – an adventure. The show at the Liverpool Playhouse comprises three works from the beginning of Matthew’s career as choreographer and dancer, pieces that he feels are special to him as he also performed in them in his early days, pieces that despite being over 20 years’ old still look and feel fresh. Watch with Mother opens the performance and features the dancers in 1950s school uniform as they are put through their paces at the gym with the boys striking heroic poses and the girls gracelessly prancing around. While at first the piece appears to be comical, it soon becomes clear there are darker themes at play, as one of the children appears to be bullied by the others. Town and Country features more of the comedy that Matthew Bourne’s pieces are known for. The ‘Town’ section, featuring ukulele playing and a couple being bathed and dressed by servants with the loofa scene, drawing roaring laughter from the audience but also features a moving dance which details the courtship of two shy men. This mix of comedic and touching moments is echoed in the ‘Country’ part as well, where bumbling countrymen and milkmaids are offset against the surprisingly emotional funeral of a hedgehog at its close. The Infernal Gallop is by far the most comedic, and the highlight of the show, featuring a satirical look at how the English perceive the French. Complete with dancers in stripy shirts, a merman who flops across the stage like the proverbial fish out of water and a rather risqué scene around a Parisian public urinal, The Infernal Gallop highlights why Matthew and his troupe have become known as the funny dance company. While all the pieces are reflective, Matthew singled out The Dearest Love – the duet between two men in the ‘Town’ section – as his most personal work. Matthew also feels the piece highlights the change in the audiences since the work first toured. He noted how back then, the audience had different attitudes, whereas now people just see it as an endearing and moving dance. Overall, the show is outstanding with flawless performances from the dancers and is the perfect blend of comedy and emotion. It features many of the devices that Matthew has become famous for, such as doubling up couples, as seen in his newer piece A Play Without Words. This is the first time the show has toured in Liverpool and runs at the Playhouse until April 1st.